I placed an order at USAfoods for some of our favorites! 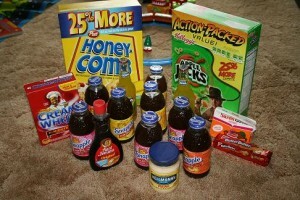 Apple Jacks, Honey Combs, Snapple, Nutter Butters! When I received the package, I was like a big kid opening up her Christmas presents, oohing and aahing everything I took out. I don’t have to order Reese’s Peanut Butter Cups or Reese’s Pieces anymore because I found a candy shop (confectionary shop in Australia) that sells them! I’m trying to convince the guy to bring in some Almond Joys and I’m set! Also there’s a supermarket here that sells Aunt Jemima pancake batter mix so I don’t have to order that anymore. Little by little I’m finding places that have my favorite American treats. Now I just have to find a place that has a bigger selection of Goya products. I can’t live without my Adobo or Sazon or Sofrito! Mmm, some nice Goya rice mixes would be good too!